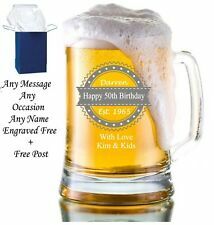 Personalised Engraved Glass Tankard Size: 135mm x 90mm x 90mm Capacity: 17. Engraving holds no colour outline cut in to glass. Ideal for any occasion. The images are there just to give you an idea of the text designs these will not be coloured, will be engraved. 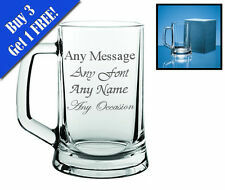 Personalised Pint Glass Tankard Wedding Father Of The Bride Gifts Engraved. Personalised Pint Glass Tankard. Personalised with up to 6 lines max 15 characters each line including spaces. Ideal for any occasion. Personalised Pint Glass Tankard Wedding Father Of The Bride Gifts Engraved. 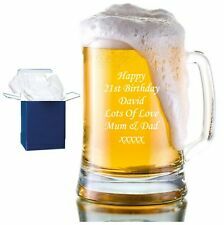 Personalised Pint Glass Tankard. Personalised with up to 6 lines max 15 characters each line including spaces. WITH ENGRAVED CARVING. SIZE IS 10.5CM X 8.5CM AT BASE 7CM AT THE TOP. Crypt Skull Tankard Gothic Drinking Beer Coffee Tea Mug Cup Home Decoration Gift. Condition is New. Dispatched with Royal Mail 2nd Class. Capacity half Pint or 284ml. Made in Italy. See photos. Half Pint beer mug. HALF PINT TANKARDS. Material: Annealed glass. Dimple design with clear badge. set of 6 glasses. Product details. Personalised with up to 4 lines. Free Gift Box. Capacity Pint or 568ml. Made in Russia. See photos. This is a beautiful handmade Horn Tankard (Mug), made from (Cattle Horn). Each pieces is truly unique and have been highly finished off by Hand. Each mug has a solid wooden base. It is approx. 600ml - 750ml that is (1pint - 1 1/4 pint). Half Pint beer mug. HALF PINT TANKARDS. Material: Annealed glass. Dimple design with clear badge. set of 4 glasses. Product details.